Taking your children camping is a wonderful way to introduce them to the unique pleasures of life in the great outdoors. After all, camping can instill a sense of childlike awe in even the most grizzled outdoorsmen. In a society where everyone is online, constantly interconnected with one another, the moments of peaceful solitude afforded by a camping trip are few and far between. As any outdoor enthusiast knows, the world feels different when you’re camping. You smell new smells, notice subtleties in the environment you hadn’t before, and hear sounds that are usually drowned out by the persistent din of modern life. In this entry, we’ll look at a few ways to make sure that your child’s first camping experience is as enriching and enjoyable as possible. Camping shouldn’t be something your kids have to do. Rather, it should be an experience that they’re actively engaged in and excited about. Let them be involved in the planning of your camping trip. Find out what they’d like to do during the trip, what they’d like to see, and where they’d like to go. Be sure to listen to the things they especially don’t want to do as well. If they’re squeamish about fishing, hold off for now and let them lean into the camping experience gradually. Like it or not, kids are going to get bored faster than adults. You might like to spend 72 hours staring pensively into a campfire, but your kids aren’t likely to appreciate this exercise in stoicism. Bring a deck of card and some books to read in case of bad weather. Turn activities like gathering firewood into a game. If you notice the kids getting restless, take an impromptu adventure on a nearby hiking trail. It can be tempting to do all the work yourself, but your kids want to feel like they can contribute. It might be easier to pitch a tent yourself, but it’s far more rewarding to watch your child drive stakes into the ground for the first time. If they express interest, don’t be afraid to let them take the reins. 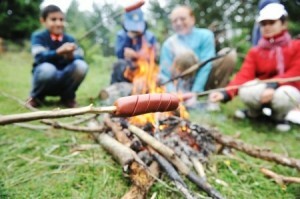 With spring in full bloom, now is the perfect time to take your kids on their first camping trip. Give us a call today to book a reservation!